Aug. 18, 2009 update: For another take on this topic, see "The 5 Most Embarrassing Failures in the History of Terrorism" by Bronzulton Q at Cracked.com. A scene from "Four Lions." Chris Morris' highly anticipated feature follows four young Muslim men on a thrillingly fictional story which illuminates the radicalised British jihad and undermines the folly of western culture's attempts to alienate them. Morris's basic strategy is to undermine and undercut. The jihadis are hopelessly confused and contradictory, caught between their assimilated lifestyle and righteous ideological fire. Omar, for example, can't stop mocking his far more religious, far more peaceable, brother. Fessel, a main vehicle for the doofus comedy, buys bomb-making material with a voice disguised as his own. (Plus he forgets about his beard when he presents himself as a "woman".) Omar and Waj bond by asserting they would happily kill the other if necessary. Barry is constantly trying to insert himself into a group trip to the Middle East, even though it is clear he is not wanted. And when the authorities finally track the group down, Morris doesn't spare them his withering eye: the cops are as incompetent as everyone else, despite their veneer of technological sophistication. A "Black Widow" suicide bomber planned a terrorist attack in central Moscow on New Year's Eve but was killed when an unexpected text message set off her bomb too early, according to Russian security sources. The unnamed woman, who is thought to be part of the same group that struck Moscow's Domodedovo airport on Monday, intended to detonate a suicide belt on a busy square near Red Square on New Year's Eve in an attack that could have killed hundreds. Security sources believe a spam message from her mobile phone operator wishing her a happy new year received just hours before the planned attack triggered her suicide belt, killing her but nobody else. She was at her Moscow safe house at the time getting ready with two accomplices, both of whom survived and were seen fleeing the scene. ... The phones are usually kept switched off until the very last minute but in this case, Russian security sources believe, the terrorists were careless. 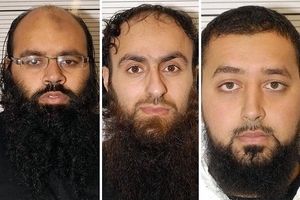 Irfan Naseer, Irfan Khalid, and Ashik Ali planning to set off bombs but gambled away the money to do so. targeted what they believed was an American aircraft carrier, but instead found a Pakistan Navy frigate and were overwhelmed before they could cause any damage, investigators said. Three jihadis were killed in the attack, four were captured and another three arrested the following day on information from interrogations. Two Pakistan Navy guards were wounded in the fighting. "It was a complete failure, they did not do any kind of damage, some were captured and we caught more, seven so far and may be more to come. They were well-equipped and came with the intention of taking a ship into their custody but they were caught in the initial stages," [said] a senior source close to the investigation.